MOUNTING KITS | Mill-Rite Inc. Custom manufactured products typically ship about three weeks after confirmation of the order. Mill-Rite also offers a range of Expedited Services to meet your urgent needs. Mill-Rite is the valve automation industry’s leading source of premier quality mounting hardware. Our valve-to-actuator mounting kits are used worldwide in all applications. 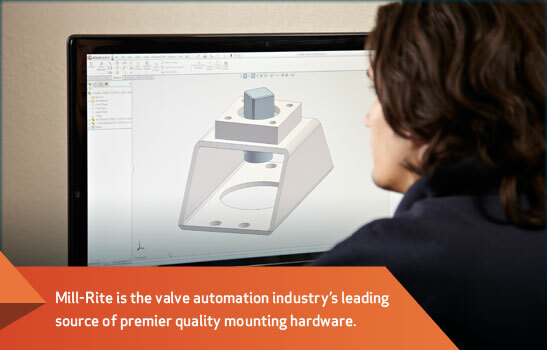 With over 300,000 AUTOCAD drawings on file, Mill-Rite’s specialized engineering and custom manufacturing team can produce hardware to mount virtually any valve to any actuator.